He’s baaaaaack. I’ve linked to David Colquhoun’s previous paper on p-values, but I’ve since learned he’s about to publish a sequel. The odds of acceptance are known as the “power” of a study. The typical scientific paper has a power level somewhere around 40% (no, really), and if 80% of hypotheses are false, then 20% of them must be true. And this is precisely the problem: most people confuse the p-value threshold with the rate of false positives, but those two are only equal when the power rating is 100%, and being a probability power cannot be that high. In reality, the false positive rate is significantly higher than people think. Even statistics teachers get this wrong. So what can we do about it? For fields where the threshold for defining statistical significance for new discoveries is P < 0.05, we propose a change to P < 0.005. This simple step would immediately improve the reproducibility of scientific research in many fields. Results that would currently be called “significant” but do not meet the new threshold should instead be called “suggestive.” While statisticians have known the relative weakness of using P ≈ 0.05 as a threshold for discovery and the proposal to lower it to 0.005 is not new, a critical mass of researchers now endorse this change. They’re not kidding about that, the paper has over 60 authors credited, including some names I’ve heard of before like E.J. Wagenmakers and John Ioannidis. This isn’t my preferred solution, but in the face of damn near seventy years of inertia despite solid counter-arguments I’ll accept even a teensy incremental change. I believe that this recommendation is misguided because it ignores the consequences of a more stringent significance criterion on type-II errors. 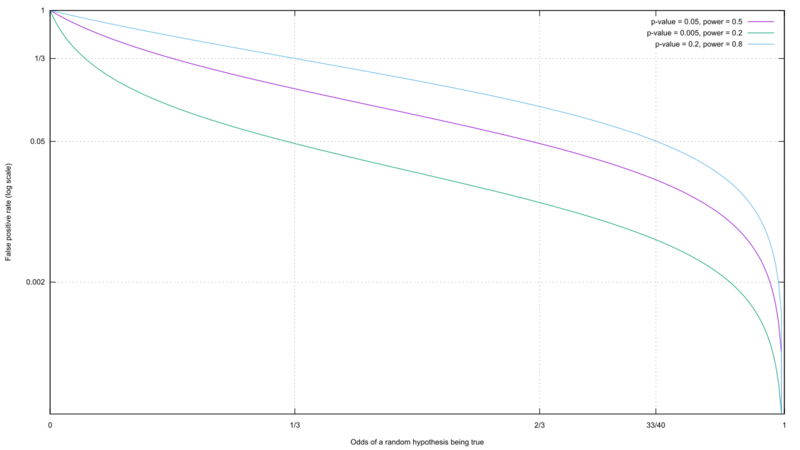 Keeping resources and sampling error constant, reducing the type-I error rate increases the type-II error rate. This is undesirable because the actual type-II error is already large. … or maybe not? That’s Ulrich Schimmack weighing in on the proposed change to p-values, and they’re no slouch either. My suggestion is exactly opposite to the recommendation of a more stringent criterion. The main problem for selection bias in journals is that even the existing criterion of p < .05 is too stringent and leads to a high percentage of type-II errors that cannot be published. This has produced the replication crisis with large file-drawers of studies with p-values greater than .05, the use of questionable research practices, and publications of inflated effect sizes that cannot be replicated. To avoid this problem, researchers should use a significance criterion that balances the risk of a type-I and type-II error. For example, with an expected effect size of d = .4 and N = 100, researchers should use p < .20 for significance, which reduces the risk of a type -II error to 20%. In this case, type-I and type-II error are balanced. If the study produces a p-value of, say, .15, researchers can publish the result with the conclusion that the study provided evidence for the effect. At the same time, readers are warned that they should not interpret this result as strong evidence for the effect because there is a 20% probability of a type-I error. Interesting, even with the deflation of power that comes with an increased p-value, we still wind up with a lower false positive rate no matter what that rate is. Admittedly, I saw this one coming. The type-I error rate is fixed by the criterion for significance, which is typically p < .05. This means, that a set of studies cannot produce more than 5% false-positive results. The maximum of 5% false positive results would only be observed if all studies have no effect. In this case, we would expect 5% significant results and 95% non-significant results. Alas, Schimmack falls for the common mistake of confusing the p-value with the false positive rate. And if you build your castle on a swamp, don’t be surprised if it falls. Colquhoun, David. “An investigation of the false discovery rate and the misinterpretation of p-values.” Royal Society open science 1.3 (2014): 140216. Colquhoun, David. “The reproducibility of research and the misinterpretation of P values.” bioRxiv (2017): 144337. Haller, Heiko, and Stefan Krauss. “Misinterpretations of significance: A problem students share with their teachers.” Methods of Psychological Research 7.1 (2002): 1-20. Benjamin, Daniel J et al. “Redefine Statistical Significance”. PsyArXiv, 22 July 2017. Web. Wagenmakers, Eric-Jan. “A Practical Solution to the Pervasive Problems Of p values.” Psychonomic Bulletin & Review 14, no. 5 (2007): 779–804. Ioannidis, John P. A. “Why Most Published Research Findings Are False.” PLoS Med 2, no. 8 (August 30, 2005): e124. doi:10.1371/journal.pmed.0020124. Schimmack, Ulrich. “What Would Cohen Say? A Comment on p < .005.” Replicability-Index, August 3, 2017. Schimmack, Ulrich. “The ironic effect of significant results on the credibility of multiple-study articles.” Psychological methods 17.4 (2012): 551.